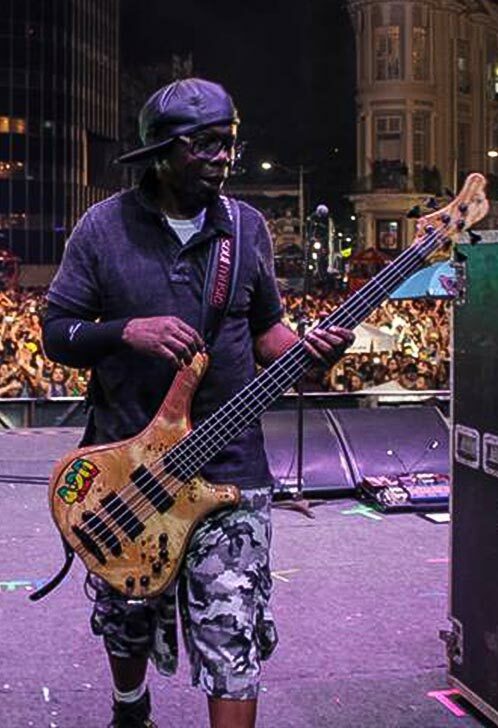 Lauro Farias is the bass player for “O Rappa”, one of Brazil’s most successful bands ever. For over 20 years the band has been recording and touring all over Brazil and the world. They blend Hip Hop, Reggae, Rock, Funk and traditional brazilian rhythms in their music. With more than 10 million albums sold, the band is a multi Latin Grammy nominated. Their live DVD “Ao vivo na Rocinha” is one of Brazil’s most successful live recordings ever. Recorded at the favela Rocinha in Rio De Janeiro, the live DVD broke all record sales in Brazil and became a landmark at the band’s career. Lauro Farias is a very groovy and strong player. He’s known for his volume and punch on O Rappa’s live gigs. Lauro became in love with the Mayones basses when he first got a chance to play a Comodous 5 strings model in São Paulo back in 2014. Lauro Farias has been using his Mayones bass as his main instrument for recording and touring with his band since he got it. He is an official endorser for Mayones in Brazil.